I am enrolled in a writing course, and I can’t even say the name of the class as it reeks of writer/family/betrayal in its highest form. While I’m not going to post any of the essays I’ve written as part of the class assignments, I am game for sharing a photo inspired by the instructor – a picture of my books on writing. 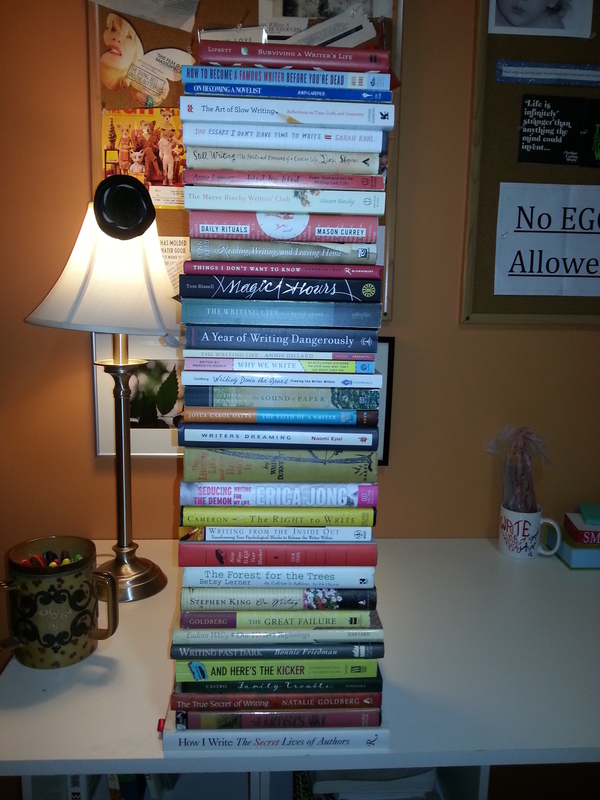 I stopped pulling titles when the stack I was accumulating began to look like the leaning tower of Pisa. Some of these I loved. Some I haven’t read. Some I bought just because I couldn’t resist the title (see: “The Literary Life and the Hell with It” – possibly my most favorite title ever). When you mix your love/hate relationship with writing with your lust for books and an unhealthy desire to collect things, you end up with the following books on writing that stand as tall as tall as your kindergartner. Oh how I love Ariel Gore’s How to Become a Famous Writer Before You’re Dead. My first thought when I saw your stack of books? You don’t need any of them. You think like a writer, like a storyteller. Except instead of the ashtray, paddle game, remote control and lamp – it’s books.